JUDGE DREDD: BREAKING BUD By John Wagner and Richard Elson. 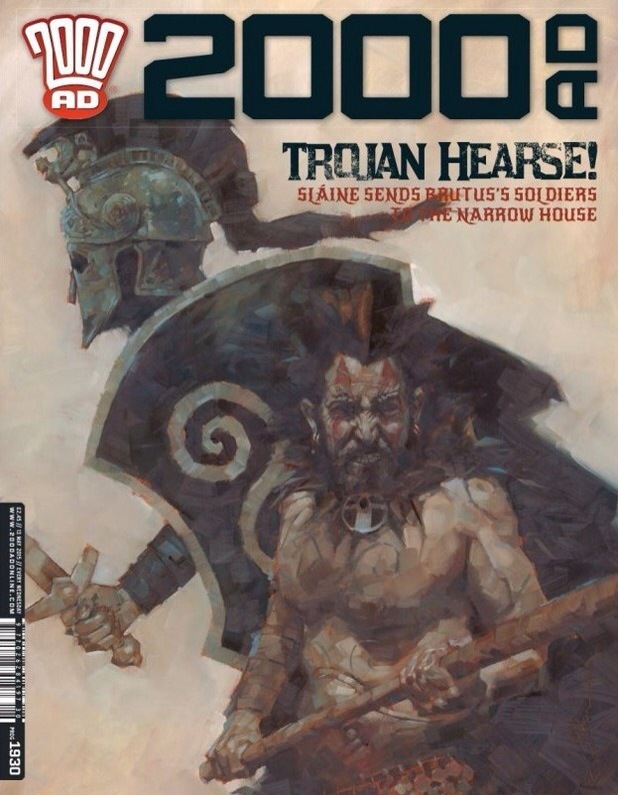 So this prog we get another beautiful, fully painted Simon Davis cover from the (quite literally) epic Sláine saga that is the lynchpin of the current run of thrillpower. From a strong issue last week, we get a new thrill in the form of that 2000AD classic ‘Terror Tales’, bringing us back to its roots in self-contained stories. With a Judge Dredd story just starting, and others in the home straight, it’s a tricky balance to sustain. Though this second issue lacks the political punch of the first part, we still get a really satisfying narrative in this tale of a disaffected family man railing against the injustices of life in the (mega)city. To some readers, the relative lack of Dredd in the iconic story might be off-putting; to me, it’s a credit to the strength of the flexibility of the form. When JD does step in, it’s great to see him back to his roots: this is proper, old school detective work, and it’s tremendous to see it unfold. There’s a strong, and fitting, element of tragedy running through this, and it’s the dystopic dredd-verse at its best. Coupled with rich, energetic art from Elson, Wagner’s writing really shines. I’m a big fan of mysterious, mythos-tinged tales, and this excellent effort is no exception. It feels like a grainy slice of 60s TV, executed in brilliant pencilling. A superb story of truly mad science, haunting and naïve youth, this is a cracking read. I really don’t want to spoil it for you, but it justifies the cover price in one go. Mills is clearly enjoying tormenting us. He draws out the agonising combat between Sláine and his Trojan pursuers, and Davis’s stylised triptych pages really draw you in. It’s a testament to what a really great team can do in that, in many ways, nothing really happens in this issue and yet you’re utterly transfixed by the prospect of whatever might be about to happen. We know that massive, horrific ultra-violence is always just around the corner, just out of sight – it’s like a technicolour 300 about to get masterfully shoved through your guts and out the other side. Glorious. Abnett’s teasing us too, but in quite a different way. Having got us settled in with his crew, going stir crazy in an alien holding pen for aliens, we’re as itchy as Bullitt and the gang are to just get out, get going, and stop the apocalyptic world-eater whether people want them to or not. In this issue, we get a much better feel for Bullitt as a leader, as he reads the other residents and starts to get them all to play to his tune – side-by-side with losing his grip on his own people. It’s a well-crafted juxtaposition, and with well-conceived aliens and stylish vistas, this is still a very strong tale in amongst stiff competition. Ezquerra is clearly loving drawing all the delights of a den of scum and villainy, because this is a filthy, seething mess in run-down, leeched out tones. With Johnny Alpha set on tracking down his prey by playing on his bounty hunter past, we just know that showdowns with old faces are inevitable. Whether you know Strontium Dog is irrelevant – it’s the Greedos to his Solo, and we don’t need to know the history to know the history. It’s again Wagner playing with his readers knowledge of sci-fi conventions without getting lost in tropes: it’s just a damn fine bit of a space brawl to offset his ongoing investigations. Cracking good stuff. I read a lot of comics. 2000AD is still the one to beat.